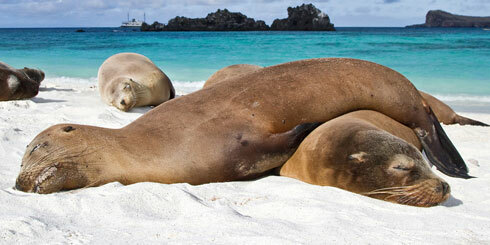 The Galapagos Islands are an archipelago located 1050 kilometers off the coast of Ecuador. The archipelago includes 13 main islands, 6 smaller islands and 107 islets that crop up on both the northern and southern sides of the equator. The first islands are estimated to have formed over five million years ago. Others are still being formed and the most recent volcanic eruption occurred in 2005. The islands emerged from the ocean depths as the result of constant eruptions, which pushed large masses of materials to the surface, creating a surprising number of large and small islands and islets, some with volcanoes. The largest volcano today is the Wolf volcano, which reaches a height of 1707 meters above the sea level. Volcanic activity in the islands is relatively high, similar to that of the Hawaiian Islands, characterized by cones that extend upwards in the shape of shields, crowned by enormous craters. The Archipelago surface covers 693,700 hectares or 1,714,000 acres and rages in height from sea level to 1,707 meters (5,600 feet). Close to 97, 5% of the surface is protected parkland, while the remainder consists of the settlements. The Galapagos Islands were unknown until just a few centuries ago. Free of humans and predators for almost all of their history, the islands have developed some of the most unique life forms on the planet, highly adapted to their harsh surroundings and ecological isolation from the rest of the world. It was not until Charles Darwin's famous visit in 1835, which helped inspire the theory of evolution by natural selection, that the Galapagos Islands began to receive international recognition. Today, the Galapagos Islands are known throughout the world for their scientific importance-for the giant tortoises and tiny finches that suggest the mechanism of evolution of life on Earth. The Galapagos Islands attract more than 100,000 visitors every year who come to experience the distinctive biodiversity and dramatic scenery. Galapagos has also drawn thousands of new residents attracted by the promise of lucrative opportunities linked to the islands' marine and terrestrial wildlife. But the ever-growing human population is threatening the future of this archipelago. With the influx of people come unfortunate consequences: unknown numbers of invasive plant and animal species are driving out native species, marine resources are being harvested faster than they can be replaced, and habitats are being degraded at alarming rates. The good news is that the Galapagos Islands are still home to most of the species that lived there before the arrival of humans, and the Ecuadorian Government and the international conservation community recognize the importance of protecting the biodiversity of these island treasures. The challenge is that available resources and conservation measures currently in place are not sufficient to protect Galapagos from the inevitable threats of the future. Conservation programs must be planned with long-term vision for the future, a common set of goals for the land and sea, and high standards demanding nothing less than full protection of the islands of Galapagos. Endemic plant and animal populations previously on the brink of extinction are recovering through pioneer giant tortoise and land iguana repatriation programs, large-scale island restoration initiatives, and targeted invasive species control. Thanks to Project Isabela, an area the size of Rhode Island will soon be free from feral goats and pigs. As a result, Galapagos rails are thriving, petrels are nesting in previously degraded areas, and vegetation such as tree ferns and endemic Scalesia arebecoming re-established. The local population in Galapagos is becoming more engaged in conservation through the participatory management mechanisms and a range of environmental education initiatives. Efforts to identify sustainable economic alternatives for local fisherman are gaining momentum. Nearly 1,000 domestic dogs and cats have been spayed and neutered as part of a pet population control program. If remained unchecked, out-of-control pet populations would pose serious problems for fragile ecosystems, spreading disease and preying on native birds and reptiles. Surveys of numerous marine and terrestrial species have been conducted. This work has supported red listing of endemic flora, rediscovery of "extinct" species, and implementation of emergency measures to protect critically threatened populations. A giant tortoise was spotted at Punta Suarez on Espanola Island. 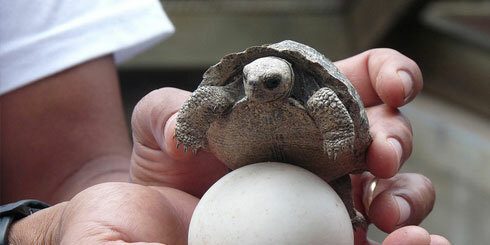 Tortoises had not been seen there for more than a century, and this sighting indicates that Espanola tortoises are achieving sufficient numbers to expand their movements over the entire island. The successful release of the Australian Ladybug, the natural enemy of the invasive cottony cushion scale, is controlling this pest which has threatened native and invasive plant species. The climate of the Galapagos islands is unusually dry for the tropics. There are two main seasons, each of which has a dramatic effect on the vegetation. From January to June, air temperatures are warm and the skies are usually clear with occasional heavy rain showers. From June to December, the air is cooler, the skies are often lightly overcast, and there is virtually no precipitation in the lowlands, while the highlands are almost continually wet. The January to June season is known as the warm/wet season and the July to December as the garúa or cool/dry season. During the garúa season, prevailing winds are from season winds from the east prevail, and the sea is more gentle. Between seasons, the weather is highly variable and unpredictable. This interseasonal period may last as much as couple of months and the dates may vary from year to year. The climate in different parts of the archipelago is also varied. Sea temperature in the islands ranges from as low as 16 C to as high as 28 C depending on season and site. The Galapagos islands are distant from any other land mass, and consequently their climate is largely determined by the ocean currents which bathe the archipelago. During the garúa season, cooler waters from the Humboldt current are dominant with average sea temperatures of 22 C in Academy Bay. As a result, air temperatures are cool and an inversion layer is created. The moisture evaporating from the sea is concentrated in this inversion layer and only the higher parts or islands, which intercept this layer, receive rain. The lowlands areas remain dry though cool. During the warm season, the southeast trade winds, shich drive the cool currents, diminish in sthength and warmer water from the Panama Basin flow through the islands. 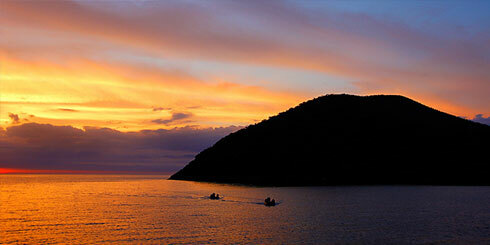 The islands experience a more typical tropical climate with blue skies and occasional heavy rain showers. In some years, the flow of warm waters is much greater than normal, and an El Nino year results. Surface water temperatures are higher and rainfall can increase greatly. Life on land burgeons but seabirds, which depend on the productive cooler waters, may experience dramatic breeding failures. There is a great variability in rainfall from year to tear, as well as from place to place, and with altitude. Climatic records have been maintained for several years bye the Charles Darwin Research Station and National Park personnel. 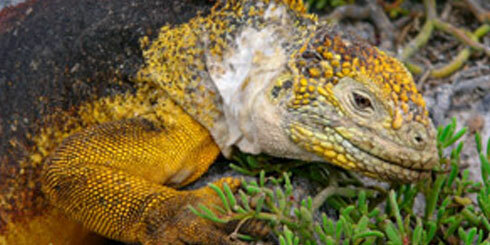 The Galapagos climate is unpredictable and often severe, especially in the lowlands. The severity of the environment and its unpredictability are in part responsible for the fact that so few species can survive in the Galapagos. The occasional drought years place strong natural selective pressures on plant and animal species that live in the islands. These droughts have probably played an important role in shaping the evolution of these species. Plants, animals, geology and climate have all interacted, and continue to interact, in a multitude of ways to create the Galapagos as we know them now. It is only through an understanding of these various factors , and how they interrelate, that we can begin to understand the mysterious ways of nature. The Galapagos Islands are one of the few places in the world that remain relatively untouched by human exploitation. The preservation of the environment is everybody’s responsibility. You can help, by following some simple rules which will help to maintain the archipelago’s fragile ecosystem intact. The future depends on you. Be careful not to transport any live material to the islands, or from island to island (insects, seeds, soil) . You are not allowed to bring pets to the islands. No plants, rocks, animals or their remains, such as bones, pieces of wood, coral, shells, or other natural objects should be removed or disturbed. Yo may damage the islands ecological conditions. Animal should no be touched or handled. A sea lion pup will be abandoned by its mother, for example, is she smells the scent of a human on her young. The same applies to chicks of birds. Animals may not be fed. It may alter their life cycle, their social structure an affect their reproduction. Do not disturb or pursue any animal from its resting or nesting spot. This is especially true for birds such as boobies, cormorants, gulls and frigates. The nests should be approached carefully, keeping a distance or at least 1 o 2 mts. If disturbed, the bird will flee and abandon its egg or chick, which could be predated or die under the strong sun within a few minutes. All groups that visit the national park must be accompanied by a qualified guide approved by the national park. The visitor must follow the trails, marked with small black-and-white posts, and never leave it. If you do so, you may destroy nests without being conscious of it (marine iguanas nest in the sand). Follow the guide, stay with him/her for information or advice. He or she is responsible for you. If the guide behave badly or does not follow the rules himself, report him or her to the National Park. Litter of all types must be kept off the islands. Disposal at sea must be limited to certain types of garbage, only to be thrown overboard in selected areas. Keep all rubbish: film wrappers, cigarette butts, chewing gum, tin cans, bottles, etc. in a bag or pocket, to be disposed of on your boat. Do not throw anything on the islands or overboard. It could end up at the coast or the beach, or be eaten by sea turtles or sea lions. A sea lion may play with a tin can found on the bottom and cut its sensitive muzzle. Sea turtles may die from swallowing a plastic bag. Do not paint names or graffiti on rocks. It is against the law, and you will be fined for it. Do not buy souvenirs or objects made from plants or animals of the islands (with the exception for articles made from wood). Among such article are turtle shells, sea lion teeth, and black coral. This is the best way to discourage such a trade. Do not hesitate to show your conservationist attitude. Explain these rules to others, and help to enforce them. Found at the confluence of warm and cold surface currents and deep cold upwelling waters, the waters surrounding the Galapagos Islands are home to a fascinating ecological system. These waters were unprotected until recently and became vulnerable to the pressures of increased human presence, fishing and tourism. 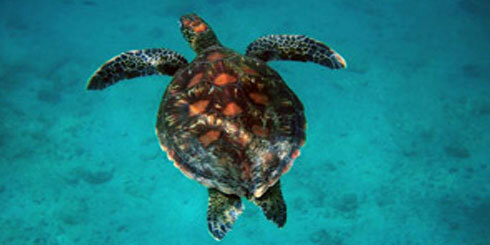 Marine life in the Galapagos waters is closely related to the life on the islands. Island animals depend on the ocean. Birds and animals existing near the water has a variety of distinctive habitats and endemic species including the world's only sea-going lizard, the marine iguana. Other notable wildlife includes the sea lion, fur seal, Galapagos Penguin, flightless cormorant, waved albatross, lava gull and swallow-tailed gull. The waters surrounding the Galapagos are home to 3000 species of marine plants and animals. Diving in the Galapagos is quickly expanding; divers seek the experience of spectacular marine life including Whale Sharks, Galapagos Sharks, hammerheads, manta rays and leopard rays. In the past few years fishing in the Galapagos has boomed. Fishermen come with lines and nets hunting for tuna. Divers seek lobsters and sea cucumbers. During the 1990's fishing for sea cucumber to supply the Asian market greatly depleted that resource. Now even though illegal the fishing continues. Another lucrative and controversial practice is fishing for shark fins. These fishermen hunt the sharks merely for their fins, leaving the rest of the animal. This depletes the area of this important predator and the attraction of divers. In 1992 a management plan was created for the Galapagos Marine Reserve, but due to lack of organization and involvement it went basically ignored. In 1997 renewed effort have brought about dramatic changes to the preserving the marine environment. All of the local sectors (fishing, tourism and conservation) have been brought together to negotiate protecting these resources. 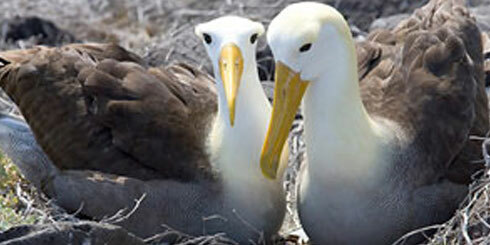 Finally in 1998 The Galapagos Marine Reserve was created. Designed to protect the waters surrounding the Galapagos Islands and the resources they contain. The Galapagos National Park Service is established as the authority in charge of administration, management and control of the marine reserve, as well as coordinating control with the fisheries ministry and the navy. Establishing a multi-sector management board consisting of the Galapagos National Park Service and the users of the Galapagos Marine Reserve. Whether you charter a boat or bring your own, all visitors to the Galapagos National Park are required to travel with a certified guide. These naturalist guides are trained in conservation and natural sciences by the Charles Darwin Foundation and licensed by the Galapagos National Park Service. The guides work as the first line of defense protecting the park's natural resources through education. They accompany visitors ashore interpreting the natural wonders of the islands while enforcing the park rules and regulations. The guides have become the eyes and ears of both national park and Darwin Station. They are out everyday in every area of the archipelago the guides are among the first to observe fires, eruptions, and introduced animals. Naturalist guides have also been responsible for identifying iguanas and tortoises in areas where they were thought to be extinct. Traditional top-level guides held a class III license. These held a university degree in the natural sciences, were fluent in English, trained at the Darwin Station and certified. Most of the luxury boats and first class boats offer class III guides where as moderate and budget boats offer a new generation of bilingual national class I and class II guide who have received training at the national park by the Charles Darwin Research Station yet may or may not have a university degree and do not have the same degree of experience as the level III guides. Special interest trips including photography and birding often have a tour leader accompanying the guide. Tour leaders are not necessarily trained at the Darwin Station nor holders of an appropriate license. Instead they are experts in the field and have come to the Galapagos to hold a seminar or seminars on their subject of expertise. Trips featuring dive itineraries have dive guides. These guides hold both a naturalist guide license and a separate dive license. Many of the boats that take diving seriously will have a dive leader on board as well. This person may not have the naturalist guide license, but often has had much more experience running dive trips abroad, often in the Caribbean. What to take: Cameras… Galapagos is one of the very best places in the world to photograph not only wildlife but also plants, landscapes and lava patterns. For many people this could well be a once in a lifetime visit, so it’s worth making the effort to obtain as good a photographic record as possible. The choice of cameras available today is vast. It should always be remembered that the welfare of the welfare of the subject is more important than the photograph. Do not leave the trail. Do not use flash if it might disturb the subject. Do not make lots of noise. Do not discard any form of litter. Take only pictures leave only memories. One of the most attractive features of bird watching in the Galapagos is that you can identify most species without being an expert. In the first place there are only about 60 resident species and 13 of these are the finches. These constitute 50 per cent of all the resident land species and several can be identified according to island location and vegetation zone. Some species, like the penguin and Flightless Cormorant, virtually identify themselves. So while you will be able to identify most species quite easily by location, there are others, including some finches, where you need a good view and a good guide to help in the identification. The relative paucity of species is actually one of the beauties of the birds of Galapagos. The finches and mockingbirds are excellent examples of adaptive radiation, where a species has evolved characteristically on an isolated island. This is not surprising in the case of reptiles and mammals that cannot fly but is quite surprising with birds that could, in theory, move from island to island relatively easily. You should not look on adaptive radiation, or the evolution of new species on particular islands as a thing of the past. It is almost certainly continuing even now, but so slowly that it may be hundreds of years before any visible differences are evident. It is also worth nothing that the number of resident species of bird is growing. At least five species have become resident in the last fifty years. Some of them appear to have arrived independently and the others were almost certainly introduced by man. In addition to the resident species, there are a number of regular visitors. These are mainly migratory waders from North America. They are therefore generally to be seen in their winter plumage and so can be quite difficult to identify. However, some can be found in the islands all year round and it is possible that these may eventually become resident and breed. Because the Galapagos islands are surrounded by thousands of miles of open ocean, seabirds have a prominent place in the fauna of the islands. There are nineteen resident species, five of which are endemic, and most of which are likely to be seen by the visitor who spends a week in the islands, whatever the time of year. There may be as many as three-quarters of a million seabirds in the Galapagos, including 30 per cent of the world’s blue- footed boobies, the world’s largest red-footed booby colony and perhaps the largest concentration of masked boobies in the world. Birds must keep their plumage in good condition if they are to survive and breed. Most seabirds change or moult their feathers each year or so before they become too ragged. Between moults, birds spend much time preening their feathers, straightening them out and keeping them oiled and waterproof. Visitor to the islands are able to retire to the shade during the heat of the middle of the day. Seabirds trying to raise their young must often spend hours, days, and even weeks, staying in the same spot as they incubate their egg or brood their young. Nestlings must spend months in the same place with no shade. As you wonder through seabird colonies in the Galapagos look for ways in which the birds are trying to keep cool under the hot sun. Albatross chicks are often to be found sitting in the meager shade of shrubs; boobies, pelicans, cormorants, and frigatebirds all use a form of panting called “gular flutterin”, to lose heat. The loose flaps of skin between the bill and neck are moved and the air currents generated evaporate moisture and cause evaporative cooling; boobies are frequently found with the feathers on their backs fluffed up and their bodies oriented so that the breeze comes from behind and cools the skin, and the feet are kept shaded. Red-footed boobies and frigatebirds may often be seen draped over their nest or a branch with their necks hanging down, wings drooped, and cloacal surfaces exposed to the air but in the shade of the body. 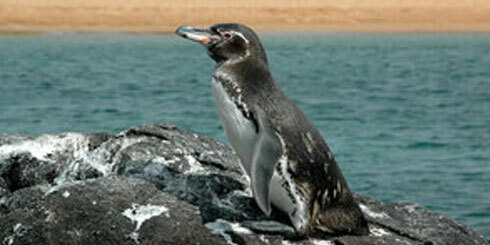 The Galapagos Penguin, at just over 50 cm in length, but only some 35 cm. tall when standing upright, is one of the world’s smallest penguins. It is the only penguin to bread entirely within the tropics and the only one to be found in the Northern Hemisphere. They are found mainly in the western islands where the water is cooler but has appeared recently to be widening its range and is regularly seen around the eastern end of Santiago, Floreana and western Santa Cruz. 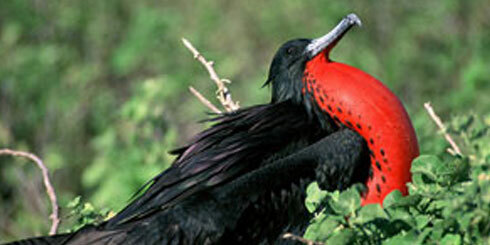 It is the largest bird that breeds in Galapagos. There is about 12.000 pair. Generally seen flying with long straight wings but not infrequently found in groups or rafts, especially close to Espanola at either end of the breeding season. Albatross are wonderful and efficient fliers; however, they expend a great deal of energy to become airborne. When at sea they make use of their webbed feet, the wind and the waves. On land, where becoming airborne is even more difficult, they need a cliff which they can jump off and an onshore wind. This is especially so for a young bird that has just fledged. It is the most easily identify , as its name suggests , by its bright blue feet. The female is larger, has an apparently larger eye pupil than the male and honks as opposed to the male’s whistle; she also generally has rather darker blue feet. These distinguishing features are most apparent when a couple is together, though the honking and whistling is recognizable on its own. 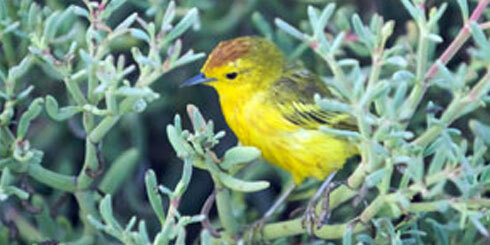 Few species of land birds inhabit the Galapagos, and three-quarters of these are endemic. Unlike the seabirds, most of which are excellent long- distance fliers, and birds from the tropics have little cause to make long flights. Twenty-two of the twenty-nine resident species are endemic and only fourteen successful colonisations could account for the present land bird fauna. Though relatives of all the Galapagos species may be found on the nearby mainland, only a freak of fate would bring them out a thousand kilometers from land. This must have happened, however, at least fourteen times in the past. With few exceptions, the land birds are a singularly dull-coloured lot. With attitudes to man that seem to range from indifference, through curiosity and fearlessness, to outright imprudence, the Galapagos land birds are a pleasure to watch. Some of the species or their ancestors have been in the islands longer than others. Some species, such as the cuckoo and moorhen are near- identical with their mainland relatives. Others have diverged slightly producing endemic subspecies or races like yellow warbler, short-eared and barn owls, vermilion flycatcher, while yet others have formed distinct species, Galapagos hawk, Galapagos dove, and Galapagos flycatcher. The land birds as a group include two of the most impressive examples of evolutionary change in the Galapagos: the mockingbirds and Darwin’s finches. Only six species of mammals can be considered as native to the islands. The tropical sun and lack of food and water for the 1,000 km journey has screened out most of the mammal order which has been so successful elsewhere. The two bat species certainly arrived by air, probably in the same way as the native land birds, while the rice rats must have rafted to the islands. The sea lion and fur seal arrived by swimming. The absence of large mammalian predators probably accounts for the fearlessness of the other native fauna towards humans. 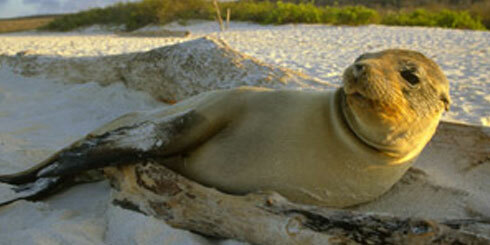 The Galapagos sea lion is the largest animal in the islands, these creatures seem almost human in so many ways. They are inquisitive and playful, yet aggressive at times. They are attractive and endearing, but also lazy as they lie on the beaches soaking up the sun and replenishing their oxygen. The Galapagos fur seal are less often seem than the sea lions, even though their total populations are similar, this is because fur seals prefer rockier, steeper more tugged shores with plenty of shade. One of the most significant features of the wildlife of Galapagos is that the land animals are predominantly reptiles whereas in most of the world mammals are dominant. Reptiles are dominant in Galapagos owing to the isolation of the islands. The twenty-two species of Galapagos reptiles belong to five families; tortoises, marine turtles, lizards and iguanas, geckos and snakes. 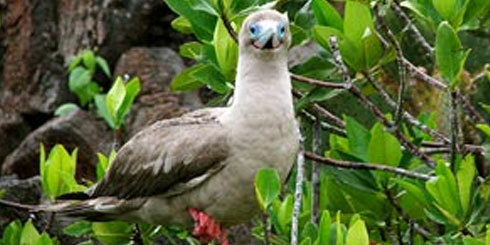 Twenty of these species are endemic to the archipelago, and may are endemic to individual islands. These islands have been famed for their giant tortoises ever since their discovery and these enormous creatures continue to be the best known of the Galapagos animals. The marine life of the Galapagos is exceptionally rich for the tropics. The combination of cool upwelling waters in some parts and warm tropical waters in the others allows for an astounding diversity of marine creatures. Sharks, turtles, sea lions, fish and invertebrates abound. Some 306 species of fish are found in Galapagos waters of which nearly a quarter are endemic forms. There are only a few small, and not very diverse, coral reefs, but the vesicular and creviced nature of the lava rock provides abundant shelter near the shores, and the open water is nutrient rich and swarming with life from the upwelling currents. Occasionally, with the El Nino flow, the cool waters are displaced by warm waters and the ecology of the Galapagos marine ecosystem is drastically changed. 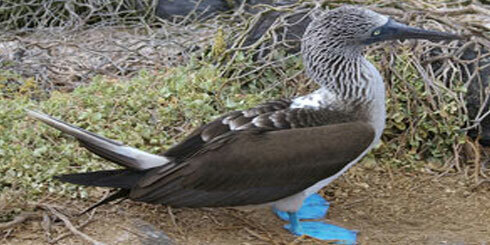 Most Galapagos waters are still unexplored and new species continue to be discovered. Few visitors get a chance to scuba dive, but almost every visitor has the opportunity to do a mask and snorkel and peer down into the rich and varied shallows.